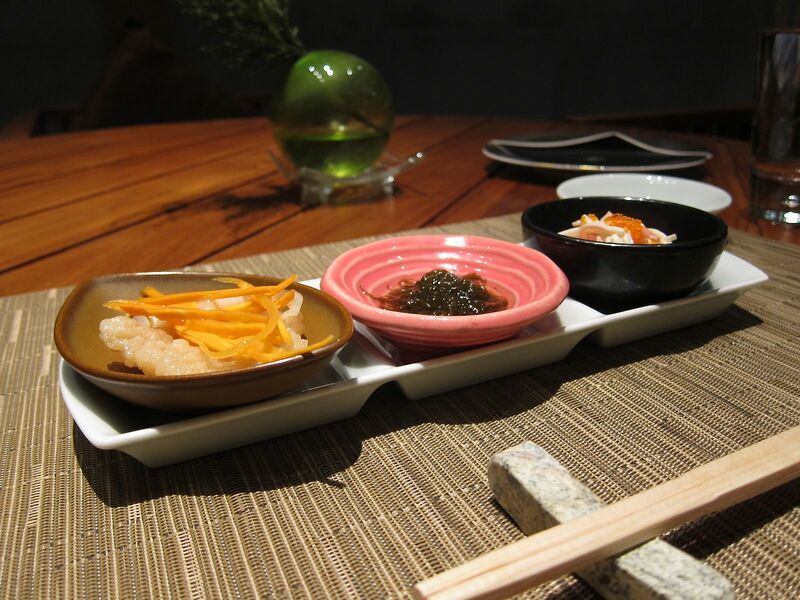 In addition to their a la carte menu, Edo offers Chef’s set menus to those who want to try a fuller culinary journey of Japan. I tried to do a few things differently from my last time here. 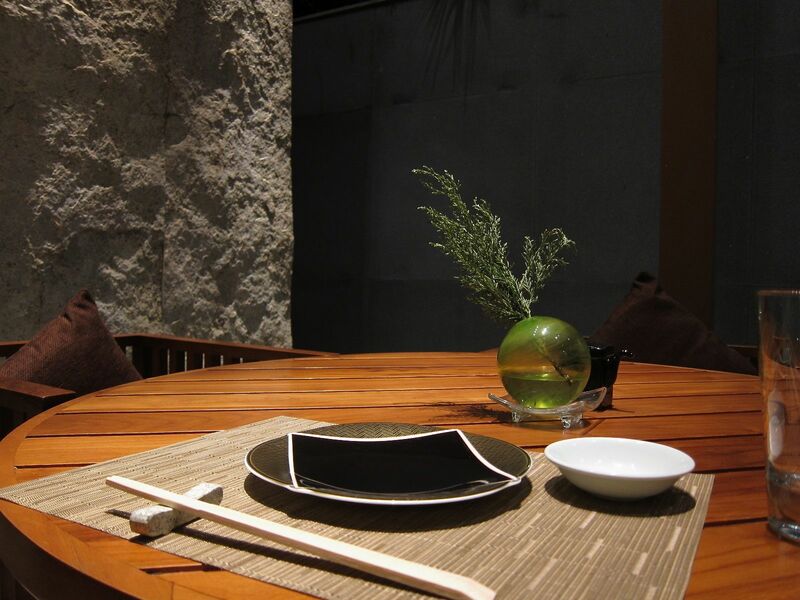 I asked to be seated in their outdoor section and chose the Kyoto set menu. The outdoor section is small but tastefully set up. There was only one other table occupied - a couple on a date. I noticed they now offered their menu on an iPad. 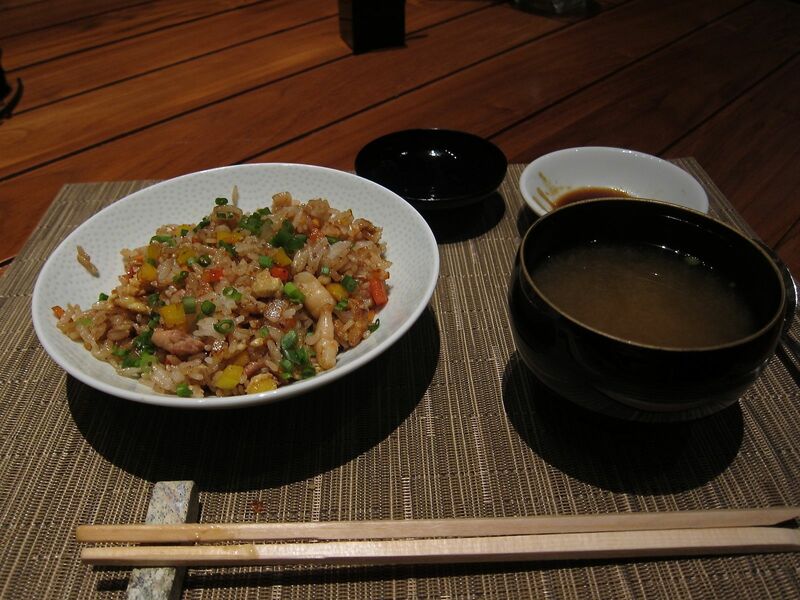 The portions seemed a little smaller than before, but that is actually a good thing given the number of courses. They started me off with three small dishes: strips of crab-meat in a creamy sauce garnished with roe, seaweed in sake, and fried fish. All nice and distinctively different on the palate. 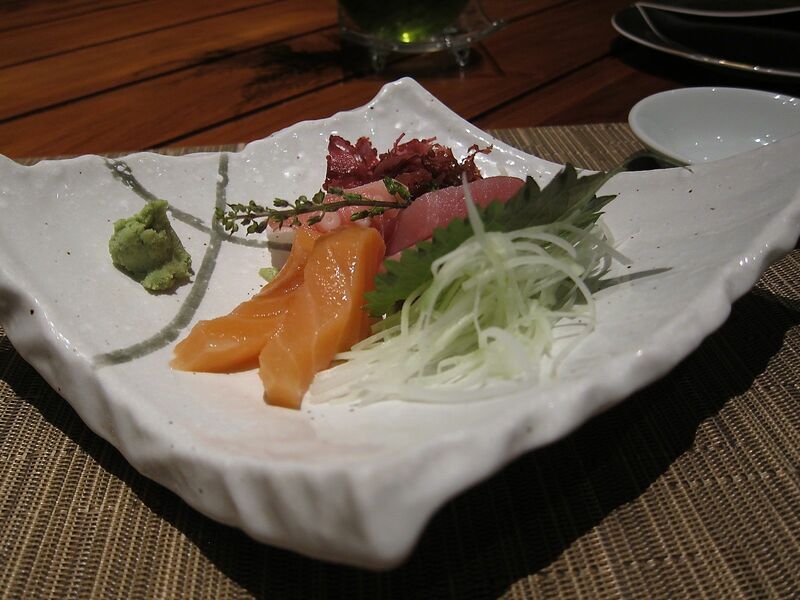 That was followed by a small platter of sashimi with slices of tuna, salmon and octopus. The fish was pretty good and fresh. 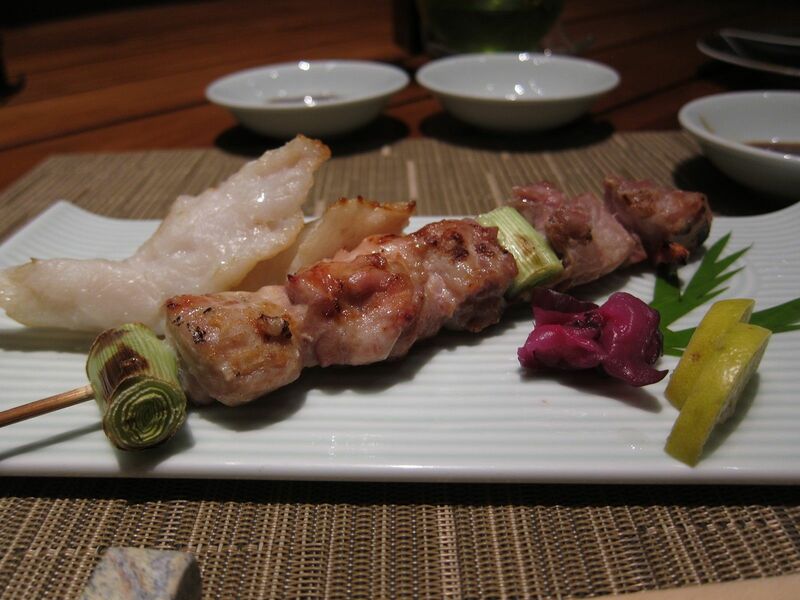 Next came the skewer of chicken and fish from the Robatayaki grill - a speciality of this restaurant. They served the dish with a teriyaki dip and spicy sesame powder. In it’s original form, Robatayaki is eating close to the grill where you can interact directly with the chef. The flames, the smoke, and the dynamic actions of the chef make this experience exciting. Of course, today, I only enjoyed a sanitized version of the actual experience. The Nimono was next, a dish of steamed/braised prawns, fish and veggies in a sake sauce. 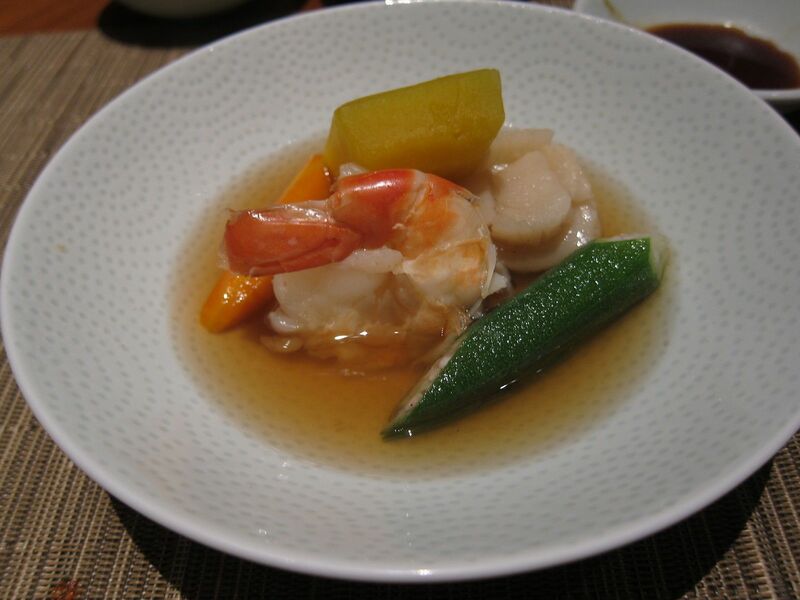 Nimono dishes are stews seasoned in salt, sake, soy and mirin (sweet soy) in a heavy covered pot. 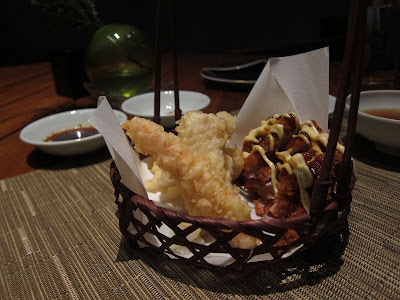 The Tempura that followed was fantastic. Lightly battered prawns and pork served in a nice little woven bamboo basket. A trick to making great tempura is getting the batter right so it doesn’t absorb too much oil and ensure the final product has just the right golden color. 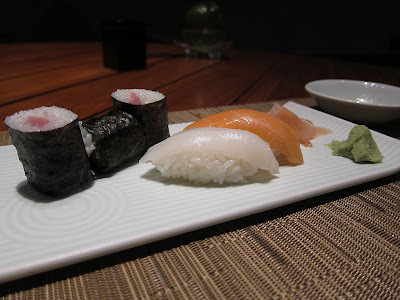 The sushi platter was simple but effective, a combination of nigiri and makizushi. Now it was time for the mandatory 'rice set’, fried rice tossed with vegetables, seafood and meats. Eating this course brought back memories of my memorable lunch at Kutani in Tokyo. The accompanying miso soup was pretty good too. Finally, came the desserts - the only non-traditional part of this dinner. 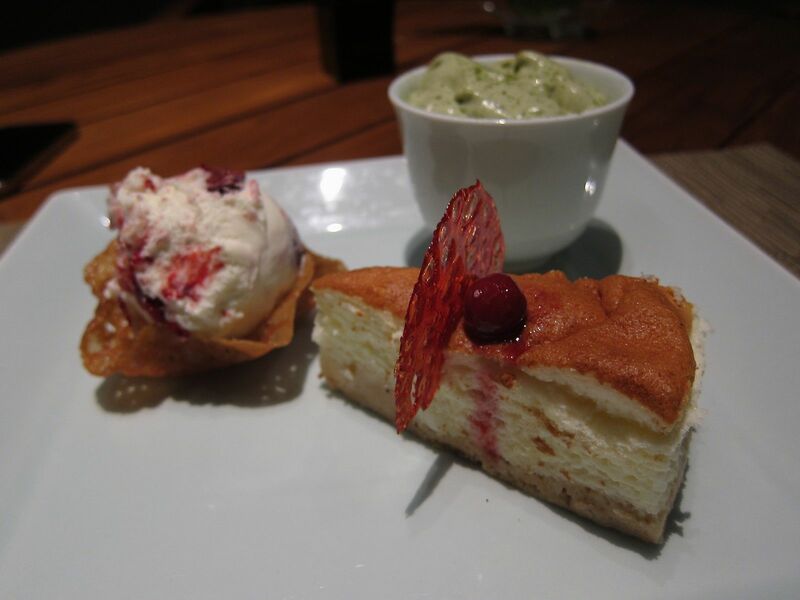 A selection of key lime cheesecake, green tea mousse and ice-cream. Nothing particularly Japanese among these selections, none-the-less a good ending to a very satisfying dinner. At the Kababs & Kurries on the next day, I chose the Biryani Platter for lunch which was a complete delight, mostly because of the selection of kababs and curries that made up this particular set menu. The platter includes a well-made Shami Kabab, a variety of kabab that is - sadly - rare on menus now-a-days. I still miss those times at the dhabas opposite Hotel Clarks Awadh in the kabab heartland of Lucknow. Ah what shami kababs and boti kababs those places conjured up then! The Biryani Platter also has Mutton Burra Kabab and Fish Tikka, both nicely crafted.The Mirch-Baigan Ka Salan was wonderful, especially with the fragrant dum biryani. We ended with a alphonso mango rabdi which was good, but a little too sweet. I had not carried a camera with me, so I do not have pictures this time. One doubt always lingers in my mind, inspite of taking in so "much" food, be it Biryani platter, or trying a filled thali, you do not seem to put on even slight weight.